Jason Richardson from Griffith Pioneer Park. Today marks the third annual Museum Selfie Day. Organised by Culture Themes, anyone can join in on social media using Twitter and on Instagram with the #museumselfie hashtag. 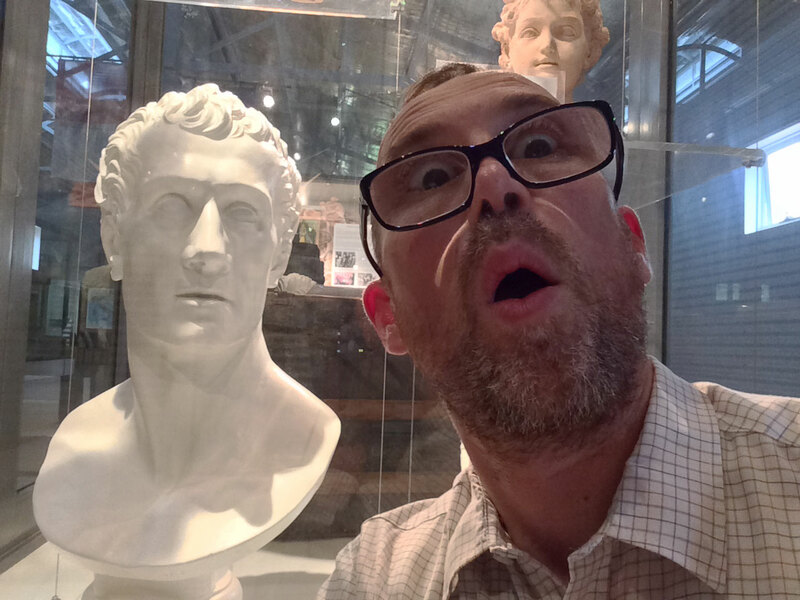 Use the #museumselfie tag to share a few taken by staff and visitors at your museum to join in the fun! There was once a time when taking selfies in museums was a curious new behaviour. The first time I saw it, I was confused. I was the only other visitor in the gallery at the time but I sensed a larger audience to the moment. I wondered why people take photographs of themselves with museum objects? What do these images mean? How do these images speak and how can we understand what they are saying? American artist, Agnes Martin, once wrote that “when we go to museums we do not just look, we make a definite response to the work” (2005). We can think of museum selfies as a definite response to museum objects. These images are a form of self-expression. By creating these images, visitors are expressing their sense of self using museum objects and including these objects within their social community. I argue the selfie is a natural fit within the museum visitor experience. Both the museum experience and these types of images are highly personal, embodied and felt practices. Across the museum audience research literature, a growing body of evidence places identity at the centre of the visit experience. And with social media now a prevalent presence for many, the performance of self is explicit and communally acknowledged. Selfies are just one method to communicate our identities as part of the performance of everyday life. By taking a selfie, a museum visitor performs her identity in that moment by weaving a museum’s object or building into her image. These images are everyday enactments of identity, momentary and fleetingly connected with a particular place or object, “featuring the same kind of intensification that museums convey upon objects” (Jay Rounds, 2006). In this way, selfies in museums are those “unique and ephemeral moments” when the museum and visitor are “one and the same – visitors are the museum and the museum is the visitor” (John Falk, 2009). On a more practical note, museums can talk about selfies in ways that encourage desirable behaviours from visitors. The Royal Ontario Museum in Toronto did just that in 2015 by publishing a selfie guide that went viral and included playful reminders about being careful of objects and barriers. Similarities between the embodied and emplaced museum experience and the taking of selfies can be used to create personal connection and encourage meaning-making in the museum. For this reason, some museums have included selfies in their exhibition and educational programming. And going further, some visitors are using selfies to highlight diversity issues in our cultural institutions. Selfies have the potential to reveal insights into the museum experience. Museum staff can learn to read these images not as texts, from the outside looking in, but by speaking to their creators. Deeper engagement with visitors who take these images will ignite conversation and reflection about the motivations behind them and their role within the museum experience. So this year, on Museum Selfie Day, I encourage you to talk to selfie-takers at your museum. Go forth and selfie! Meet Alli Burness, a museum digital producer. She’s an advocate for digital museum audiences and a museum selfie enthusiast. You can find her on Twitter @alli_burnie.